Tea Party members say they are expressing the public's will. Gee, if only there were some way to judge popular sentiment in a democracy. 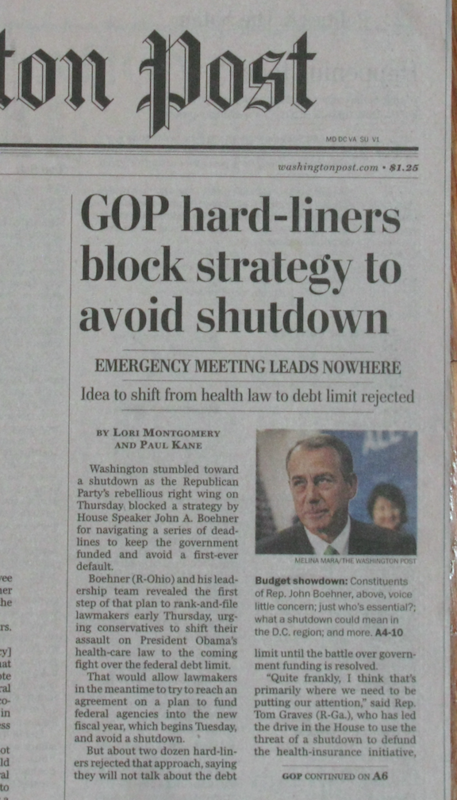 The unfortunate story that leads the WaPo today, with the photo and headline shown here, represents a step backwards from an increasing mainstream-journalistic willingness to discard reflexive "isn't gridlock terrible" hand-wringing and explain what is really going on. Here's why talk of "primitive, leaderless village" problems blurs rather than clarifies today's realities. OR ELSE all other business of the government will be halted, and the full faith and credit of the United States will be called into question, with unknown but likely bad world-financial consequences. This is not what either John Boehner or Mitch McConnell says he stands for. I have no doubt that Obama could ultimately strike some compromise with even McConnell's filibuster-happy Senate Republicans and any kind of normal Republican majority in the House. In the end Democrats would complain that Obama had caved, Republicans would complain about Beltway insiderism, but some deal would result. Yet enough of today's absolutist House members think in exactly these Either/Or terms that normal compromise is simply impossible. Compromise itself is as much their stated enemy as is Obamacare. If you're urging a search for "common ground," please tell me where you see any in this case. I argued recently that the closest parallels in our history were to the John C. Calhoun era before the Civil War. If you think that's unfair, please tell me another case in which a dissatisfied minority threatened to shut down the entire government, and if necessary renege on the national debt, unless a sitting President agrees to reverse his hardest-won policy accomplishment. And, yes, a dissatisfied minority. This brings us to the part of the struggle that gets far less ink than it should. 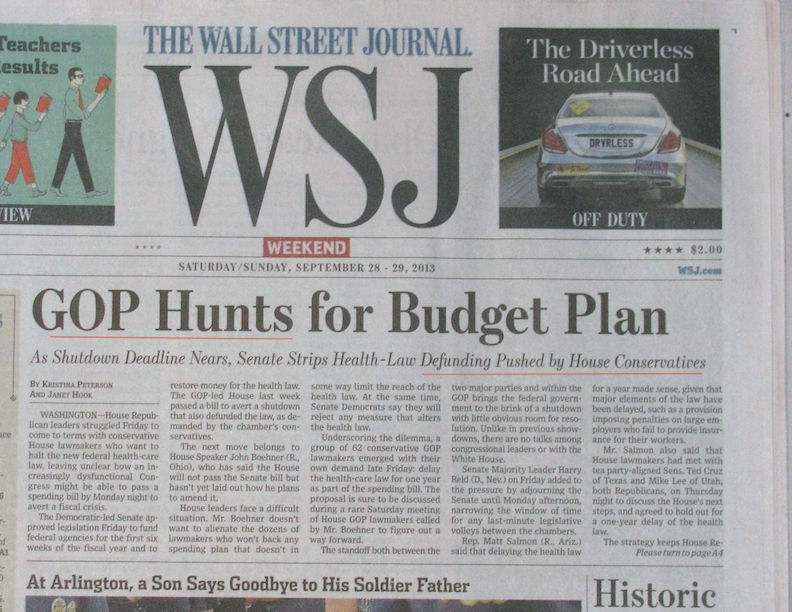 What's the basis for the GOP claim that the time has come to "defund Obamacare" and threaten default and shutdown to get their way? Their passion comes from their contention that the public has turned against this program. Thus, they are doing no more than reflecting popular will. 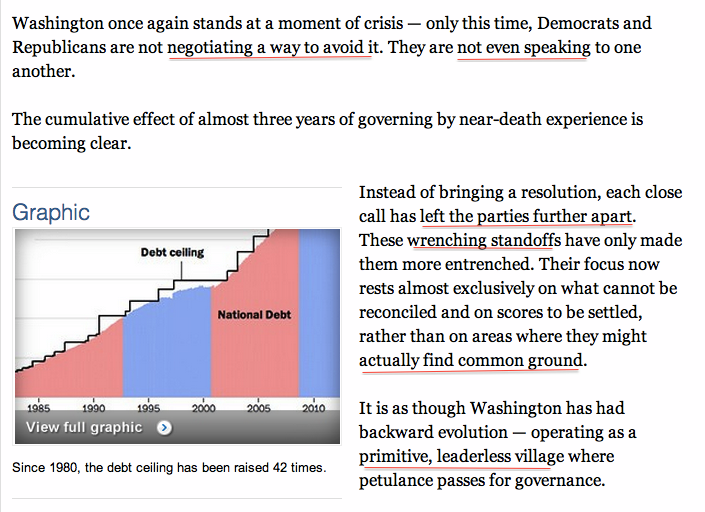 1) Just last year, a presidential election was fought over this exact issue, along with economic policy more broadly. When the votes came in, Barack Obama scored a runaway Electoral College win -- and became the first person since Dwight Eisenhower to get more than 51% of the popular vote twice. The 51% figure is something of a trick comparison -- Ronald Reagan got just over 50% (but not 51%) in 1980 because of third-party candidate John Anderson. Bill Clinton never got even to 50% because of Ross Perot. Still, we very recently had the most formal test a democracy offers of a president's policies, rather than some set of push-polls, and Obama won in a walk. 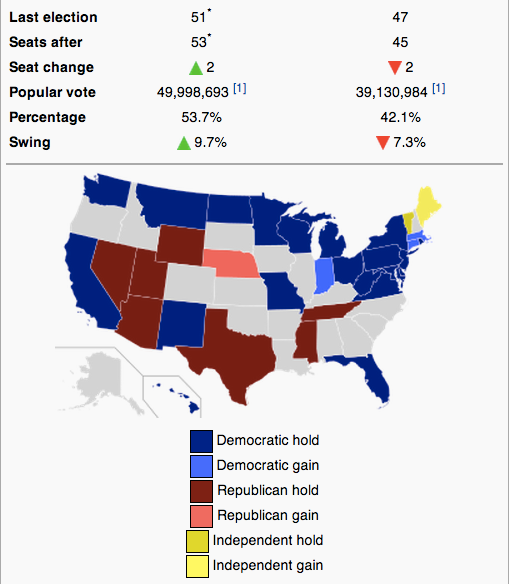 2) In that year's elections for the Senate, the Democrats increased their majority by two seats and overall received 10 million+ more votes than all Republican candidates. 3) And last year even in the elections for the House, Democrats -- who for better or worse were forced to run on Obamacare and the president's economic policies -- gained 8 seats and received 1.7 million more votes than did all Republican candidates combined. Yes, the "total House vote" figure also has its trick-question aspects. Close races bring higher turnout for both sides, as compared with safe-district incumbents. 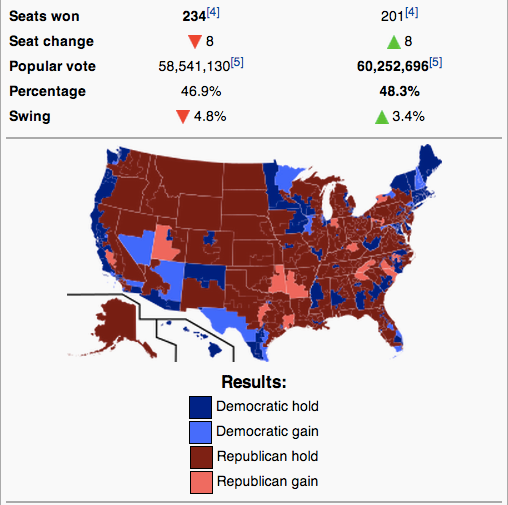 Still, all evidence suggests that without post-2010 gerrymandering, the Democrats might well control the House right now, along with the Senate and White House. For instance: Obama easily beat Romney in Pennsylvania, but post-2010 gerrymandering means that Republicans now hold 13 House seats there, versus only five for Democrats. You can call this a lot of things, but "gridlock" should not be one of them. And you can fault many aspects of the President's response -- when it comes to debt-default, I think he has to stick to the "no negotiations with terrorists" hard line. But you shouldn't pretend that if he had been more "reasonable" or charming he could placate a group whose goal is the undoing of his time in office. 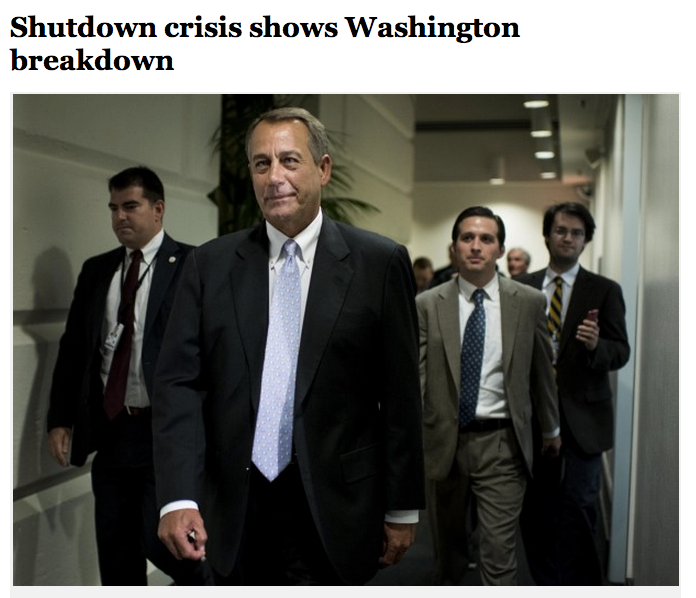 The real question now is what Boehner, McConnell, et al. can do about their hard-liners. A lot depends, for Americans and many others, on their success or failure.